Very interesting theory and wondered what you academics think about this intriguing idea? I do know that some animals in the wild do take psychedelics so its fair to assume that our ancestors did too. Could this really have given us the ability to get to where we are today? For me this brings up so many fascinating questions and would love to hear what you guys and gals think about this please. Last edited by mtbturtle on March 26th, 2012, 10:00 pm, edited 1 time in total. Re: Human Evolution and Magic Mushrooms? It made me read in multi colored text so I didn't get that far. mtbturtle wrote: It made me read in multi colored text so I didn't get that far. That's just the effect of all the mushrooms you've been eating. The text is black on white really. If I've been eating those kinds of mushrooms I want my money back! There are quite a few holes in the logic at the site. They assume that only shamans painted the cave paintings and they assume the shamans were using psychedelic drugs. Yes, shamans do paint symbols and yes, SOME shamans in some societies have been known to use psychedelic drugs. It's an unsupported leap to say that the Cromagnon paintings were the same and then an even bigger leap to say that our entire abstract thought came from eating mushrooms. What's more, it is difficult to do detailed accurate renditions under the influence of psychedelic drugs, but that is exactly what we see in the Cromagnon cave art. Recent studies indicate that abstract thought -- in the form of art -- dates back further and is expressed in jewelry and other art. So it is difficult to see how that would be due to taking psychedelic drugs. Oh yeah there are are holes. But its an interesting line of thought. I certainly think its a factor NOT the only factor. Ergot and all sorts of stuff are lying around out there. Everything is a drug and affects us. After looking at this I did a quick search on LSD and the guy who made it died at 102 and said its just a drug that makes us the way we are supposed to be. He took it and seems to have lived a full life. Not saying its a good idea to go out and get stoned everyday but I'd say its worth trying if you are of sound mind. I agree the leap from mushrooms to induced states to produce paintings is a bit much! I can certainly imagine one of our ancestors eating something weird and tripping leading to a moment of "inspiration". I think these kind of drugs do certainly help tap into our "potential" but its a gamble. I am sorry I did not go and visit the proposed site. So, I apologize in advance if my point does not pertain. I have the impression that under this argument lies an implicit association: abstract = immaterial, therefore abstract thought = capability of departing from reality, imagining irreal things, evading from the schemes of experience. Well, I think such an association is profoundly misleading. Abstract thought mainly arises from generalization, which is a way of addressing elements of reality and experience. Extracting immaterial schemes and features from elements of experience has nothing to do with manipulating irreality. 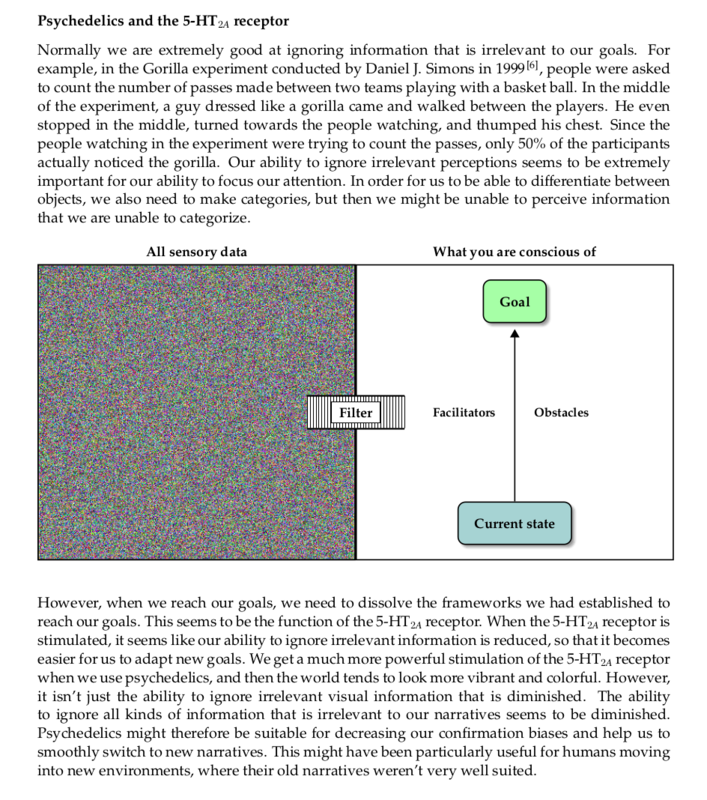 A further great contribution to abstract thought comes from simulation and prefiguration. These are properties that have nothing to do with possible enhancement of creative imagination, brought about by disperception and destructuration of thought related to allucinogenic substances. Rather, simulation and prefiguration are functions related to behavioral control and strategic planning. These functions are performed by the prefrontal areas in our brain, which display a paramount increase in size and performance in humans, with respect to any other animal. The use of language - and drawing and writing - is not based on particularly intense perception / imagination (or disperception / delusion); rather, it depends on the ability to extract schemes and features from reality, and therefore on generalization. Conceptualization and symbolic activity are fundamentally based on such generalization, and constitute the ground for abstract thought. BadgerJelly wrote: What colour is Happiness? Do you mean to address my notes, by this question? Do you really think that abstract thought only consists in wondering about immaterial things, which cannot be assigned a colour or a shape? If so, I apologize, I was talking another language, in which colour and shape also pertain to abstract thought. Collaterally, the question is interesting because we all have some vague synaesthesic capability, and if you ask it out of context, one may naively answer "pale-blue, or cyan, maybe?" (but I persist in not liking to follow the links and only reading what is in the posts). Never heard light blue/cyan before. Most people say red or yellow. Anyway to the point! Cross sensory perception is something all creatures have to a degree so it is believed. Humans can train themselves to function like bats with echo location or have an inner compass. Hallucinogens tap into this ability and would create a different view of the "real" material world. What I am suggesting is that drug induced states can make you see things that are not visible in a "sober" state. This would lead to new conceptions and idea and therefore ways of thinking. There is a guy in the UK who has all the attributes of autism but socially functions just like you and I. He learnt to speak Icelandic fluently in 2 weeks and appeared on a chat show. He can also write Pi forever because he can SEE it in his head as a beautiful rolling landscape. This is an extreme case but I don't think its a huge leap that over several thousand years of human evolution in smaller pockets of population that an outside chemical influence on the brain could cause/help the development of new ideas. I know that cross memory reference is a key function to the development of ideas and this is where many drugs play around. Add on to this an heightened sensitivity and your brain has a few extra tools to play with. I'm no expert on the brain and its chemistry but this seems like a reasonable hypothesis to me. If I can only hear or see within a limited range and then that range is briefly extended then I have more information. I see it like learning another language. The broader my perception the broader the range for new ideas. Maybe you know a lot more about the brain and its function than me but I'm pretty sure that there is more unknown than known and that DNA can be altered by what we ingest. Well like many hypotheses people have offered with regards to the deep past, this one may have some interest for those who want an interesting or alternative take on their reality but it leaves open what I think is a very important question: how do you/we find out if this actually happened? The answer, of course, is that it is virtually impossible to come up with any kind of direct evidence. Truth be told, although there are all kinds of speculations about the meaning of Pleistocene rock art (and I have a load of books on the subject), we really don't know and there are certainly great dangers in invoking analogies from North America, Africa or Australia. Forest_Dump wrote: Well like many hypotheses people have offered with regards to the deep past, this one may have some interest for those who want an interesting or alternative take on their reality but it leaves open what I think is a very important question: how do you/we find out if this actually happened? The answer, of course, is that it is virtually impossible to come up with any kind of direct evidence. Truth be told, although there are all kinds of speculations about the meaning of Pleistocene rock art (and I have a load of books on the subject), we really don't know and there are certainly great dangers in invoking analogies from North America, Africa or Australia. SPOIL SPORT!! I'll leave that to future scientific developments. NOTHING can be "proven". To me whether this is right or wrong is not important for science today but it may be in the future. The idea seems quite logical to me and maybe with advances in our knowledge of how the brain works it may hold more weight?? Its an interesting thing to ponder and I like it for that reason more than any other. Look at archaeology! We collect the data and make up theories about how this or that was back then but we'll never really KNOW without some kind of time machine. Just because we cannot prove it though we can make "intelligent" guesses and maybe uncover a little bit more of the human story. What I do know is I think I am human and in the past they were human too. If I can strip down the world I have been brought up in and image myself as a "fresh" human and explore some ideas I can see which ones make more sense than others. Its like human sacrifice! It makes sense in whatever society in the past as does cannibalism. Its just a matter of forgetting the "ethics" of today. And lets face it we're curious about the past and who we are and for that reason we will always speculate and occasionally this speculation will lead to the odd discovery that may lead to confirmation or open up another path to other possibilities. neuro wrote: I am sorry I did not go and visit the proposed site. Well, all animals have ideas formed from generalizations. A zebra is able to recognize any lion as a lion, which means that it must have a generalized idea of what a lion is. Some of our ideas ( like the idea of zero or the idea of God ) are purely abstract, and therefore not necessarily formed from generalizations. I also don't think that hallucinogens just produce delusions; they can also produce synesthesia. In our language we can talk about "hot babes", "hot food", and "a hot summer". So hotness can in many ways be considered a generalized concept derived from completely different types of sensory input. Synesthesia can be considered intermingling of different types of sensory input. If hallucinogens produce synesthetic experiences, then maybe words like "hotness" come from the usage of hallucinogens. ubericon wrote: If hallucinogens produce synesthetic experiences, then maybe words like "hotness" come from the usage of hallucinogens. I would be more careful in deriving the history of thought and language from metaphoric and anedoctical observations. neuro » April 10th, 2012, 4:30 am wrote: II would be more careful in deriving the history of thought and language from metaphoric and anedoctical observations. Sure. Anyhow, the current article doesn't focus so much upon if abstract reasoning emerged from the use of hallucinogens or not. It rather focuses upon how magic mushrooms relates to the passion for mystery. I think that magic mushrooms might make the entire world seem more mysterious to people, and that could make people more curious about themselves and the universe. And maybe to learn more about ourselves and the universe is the very meaning of life. Who knows. Anyhow. If any of you could give me any negative feedback to any of the myriad of theories I have written about on my website, I would greatly appreciate it. I agree with neuro but more so. I am in fact extremely hostile to this drivel. The basic premise here is that the only mysterious phenomena (or departure from reality) must be a product of hallucinogenic drugs. This stinks of the willfully ignorant rhetoric of a cult, if not simply a shameless advertising stunt by drug pushers. A departure from reality is already found in dreams. And all that mysterious phenomenon require is the simple acknowledgement of all the things in every age that science as not been able to explain. What kind of brain damage is behind imagining that science has always explained everything? Except for those dead from neck up, mystery abounds in the world without any use of drugs whatsoever. It is almost as if these morons don't understand that scientific explanations are themselves a PRODUCT of intellectual curiosity -- and no hallucinogenic drugs played any role whatsoever in the process! Understanding about life and science is found using the fully functioning human brain, not in the impairment due to chemical interference -- unless all you really want is to fool your brain into some illusion of meaning. I suppose there will always be those willing to short circuit their brain in order to get the high of feelin good without accomplishment or any damn good reason at all. Last edited by mitchellmckain on April 7th, 2018, 7:27 pm, edited 1 time in total. mitchellmckain » April 7th, 2018, 6:20 pm wrote: I agree with neuro but more so. I am in fact extremely hostile to this drivel. The basic premise here is that the only mysterious phenomena (or departure from reality) must be a product of hallucinogenic drugs. ! This is absolutely not true. I have never said such a thing. In fact, I think that children often are very curious. If this curiosity is allowed to grow, they might never need any hallucinogens to reawaken their curiosity. However, I believe that in many countries, the educational system works more to kill intellectual curiosity, rather than to help it grow. So lots of the adults I see around me, seem to have lost much of their intellectual curiosity. For such individuals maybe hallucinogens could help to restore a sense of curiosity. Personally I feel no need for hallucinogens, since I already have a lot of intellectual curiosity. Sure, there is a necessary balance between chaos and order. I'm not a fan of hallucinatory drugs myself but people do get stuck in ruts. The question is if the risks outweigh the benefits and there is growing interest in doing serious research on hallucinatory drugs so I will wait and make a judgement call on the cost benefit maybe sometime in the next decade. wolfhnd » April 7th, 2018, 6:33 pm wrote: Sure, there is a necessary balance between chaos and order. I'm not a fan of hallucinatory drugs myself but people do get stuck in ruts. Yes. Why do so many people vote for the same political party their entire life? Why do I almost never see politicians change (or evolve) their mindset? We like to believe that scientists change their mindset according to new research, but scientists are also humans, and I know about lots of professors that aren't particularly good at updating their beliefs. We are extremely memory-based creatures. If we already have an answer stored in our long term memory, we are usually too intellectually lazy to reevaluate if the answer is right or not. I think I would be more worried about intellectual laziness, than about hallucinogens. I think there actually is research indicating that intellectually laziness increases the likelihood of developing Alzheimer's. Also, depressants like alcoholic beverages and benzodiazepines, seem to be much more correlated with neurodegenerative diseases than hallucinogens. mitchellmckain » April 7th, 2018, 6:20 pm wrote: I A departure from reality is already found in dreams. And all that mysterious phenomenon require is the simple acknowledgement of all the things in every age that science as not been able to explain. Oh, I wish it was that simple. First of all, most people that lack intellectual curiosity are not interested in investigating the history of science. So, even if such an acknowledgement made all people curious, it isn't necessarily easy (or possible) for all people to get such an acknowledgement. Staments is a mycologist, author and advocate of bioremediation and medicinal fungi. I don't think any serious researchers of psilocybin think that it works only by generating errors in our neural processing, but even if that was the case, errors are necessary to generate variation in evolutionary algorithms. If there are evolutionary algorithms operating in the brain, those algorithms would need errors in order to generate variation, much like random DNA mutations are necessary for biological evolution. Well you are the only person I have ever talked to who gets it. I used the word error when I should have used random inputs but I did so to highlight that we tend to think because of evolved sensitivities that random events carry a negative connotations. Don't know if magic mushrooms exist anywhere (they may) but we cannot deny, can we? There is enough evidence buried underneath. How can you deny it's existence? Doesn't it kinda depend on what type of mushroom you eat? The only ones I've had were Psilocybins (spelling?) and I have to confess they taught me absolutely nothing. I thought about growing some peruvian torch cactus or even importing some Mescal, Peyote and others, but never did. On the other hand, I've had some revealing insights due to cannabis, and being a plant heavily utilized by our ancestors I would expect them to have had similar experiences. I used to argue that if I was not meant to use cannabis, why the heck do I have a bunch of cannabinoid receptors in my brain? Seemed a shame to evolve them over thousands of years and not use them. Only convention says cannabis is bad, for most of human history we used it. This relationship might prove to be more influential. Actually, many states have legalized it again, and their number is growing, not shrinking. I don't think there have ever been any recorded deaths due to cannabis either. OTOH I have met people in psychiatric hospitals with permanent damage caused by a single puff. It is not without risk. Hey guys! I just want to share this. I can still remember my first-time experience using the so-called truffle mushroom and it was one of the best feelings I've ever had back then in college and until now that I'm working in a private company I'm still taking it as a medicine for my anxiety. I'm having a hard time with it. Heres an article that i read https://www.trufflemagic.com/blog/magic-truffle-incident-in-amsterdam/ that if you are under influence of magic truffles it has many effects on you. It can be bad or good but it is your choice how you handle yourself while taking it.